I surprised even myself with the way my labour and my daughter’s birth went. I was anxious through out the pregnancy, worrying about all the things that can go wrong and trying to plan ways to handle the bad situations. My goal was to have as natural a labour as possible, with no epidural. I went to pregnancy yoga classes and also hired Sharon and Sara, my doulas, to increase my odds at having a good birth experience. So I was very disappointed and prepared for the worst when I went in for my induction. I was about 10 days late, and Natasha was likely to be 90 to 95% in weight (big baby) so my ob-gyn thought it wise to not wait too long. 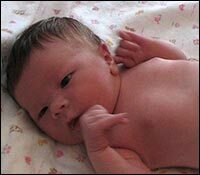 I of course agonized at even showing up for the induction, but concern over whether this was safe for the baby won and I reluctantly went in very early in the morning on June 27th 2005. They broke my water at about 7am and waited for an hour to see if that could jump start the labour (I was 2cm dilated for the past week). When nothing happened, they started me on very low doses of pitocin. Gradually, over the next 6 hours or so I began to slowly feel the contractions. My husband, Jean-Marc was there vigilantly watching the fetal monitor, and Sharon and Sara calmly waited until things picked up  and they eventually did. As the contractions increased in intensity and frequency, I focused more on breathing and meditation. I entered a sort of zone where I was very sensitive to all stimuli, and so kept my eyes closed and refused to be touched. Sounds, smells, everything seemed to overwhelm me and interfered with my ability to cope with the contractions. So I went deeper and deeper into my zone, grunting commands whenever I needed something. I walked a lot, sat, danced, bounced and vocal toned through each contraction. I eventually achieved my 10cm sometime early Tuesday morning. The only problem was that I did not feel like pushing! So I walked more and tried different positions, but the urge did not come easily. Eventually the resident came in and advised me to either start pushing, or wait until the urge came naturally. My husband felt that I should wait, but the doulas advised us to start pushing now. They knew that if I would not push, I might not make enough progress and my chances of a c-section would go up. So I pushed and this was the most difficult part for me, since I still did not feel the urge! It felt like 3 hours of pushing without the urge. Eventually, the ob-gyn was called in and she assessed the situation. She said if I did not make any significant progress in the next 30 minutes, we would have to consider a cesarean. When I heard that, after all the effort I went through, being induced, not having an epidural, all the agonizing pushing and to end up with a c-section! Something snapped inside me and I found the energy to push very effectively. When the ob-gyn came back, the head was crowning and we were in business! Natasha was born at 9:21 am on Tuesday June 28th. It was the hottest day on record in Montreal. She weighed 4010g or 8lbs 13 oz. As soon as I saw her I thought she was the most beautiful baby in the world. I also felt like the luckiest person in the world to have all this help and to be surrounded by competent people. I felt an outpouring of happiness and thankfulness. Read Leanna's birth story of her second baby, baby Luke.